Visionary thinking typically receives quick turndowns from cautious leaders. People start thinking small and safe. 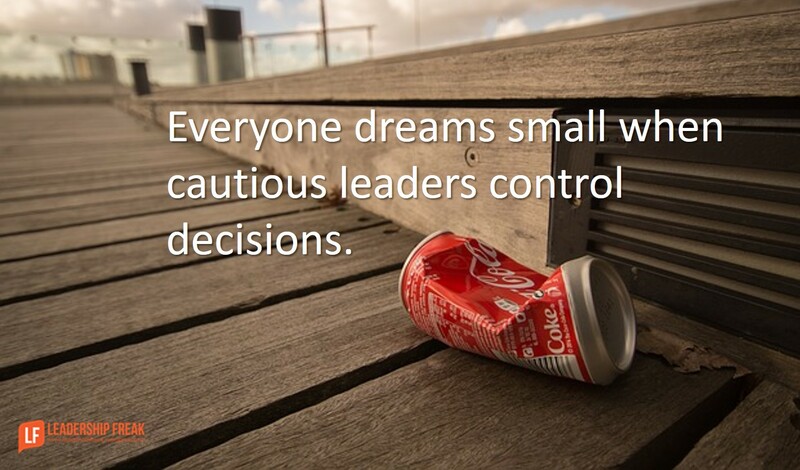 Everyone dreams small when cautious judgmental leaders control decisions. Traditional management culture encourages everyone to lower expectations and ask for less. Don’t ask for any visionary idea. Limit focus. We’re not working on…. Seek suggestions for specific objectives, new initiatives, or important projects. Seek ideas that make work better for large numbers of people, not just one. Explain why you want to improve inter-departmental communication, for example. Are you working to create efficiencies, lower conflict, or prevent mistakes? Purpose clarifies direction, fuels passion, and establishes boundaries for thinking. Make daring decisions that connect to near-term objectives. Over the next six months we’re working to improve cross-department communication. Our focus for January is lowering customer complaints by X%. During the first quarter, we’re working to build a work environment that makes co-workers and colleagues feel useful and valued. What’s your big ask? The next time you want a visionary idea, explore options and then ask for the big ask. If you knew I was going to say ‘yes,’ what would you say? What’s the biggest improvement you can imagine? What are the three most daring things you could hope to achieve? If you were in charge, what would you try to accomplish? #5. Determine a step in the right direction and take it. Establish a low cost pilot program. Invest in research. Survey customers, for example. Explain that this small ask is part of a big ask. Take a step. Evaluate. Adapt. Take the next step. Cautious leaders drain creativity and boldness from teams. How might leaders turn cautious teammates into visionary leaders? Nice. Keep things nice and SAFE! But do appeal to the vision and impact. Also remember the critical aspect of actual involvement in the framework to develop a sense of ownership and engagement. When I was a rookie outside consultant, the grizzled plant manager told me over and over again that he was viewed as The Best Plant Manager in the network of 22 plants. For Years. SO, I go in, get whole big bunches of improvement ideas from the union front-line people and we implement something like 23 different improvement initiatives around quality, waste and uptime. Most all had measurable success and a couple were wildly successful. On the other hand, Frank simply did not want to look bad. I thought the improvements in these non-profitable enterprises would bring him some recognition, but ALL he saw as a loss of face, like “why did I not do those things before.” When I left, nothing was maintained and things went right back to the previous performance levels. The company sold the whole division not too long afterwards. OWNERSHIP is also a key to all this Visionary stuff. Humility takes organizations further than ego. Humility allows us to take ownership of ideas that weren’t ours.